Home > Free > Cardstore.com: Free Greeting Card + Free Shipping! Cardstore.com: Free Greeting Card + Free Shipping! Snag a FREE greeting card from Cardstore.com right now! 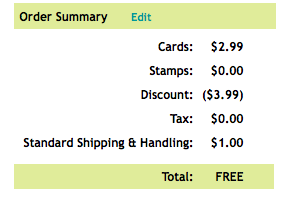 Use coupon code MCSFREE112 during checkout to get the card completely free! Select your card, personalize it and then pay nothing… fun times. You won’t even have to put in a credit card!